Do you have oil and metal flowing through your veins? Nothing revs your engine the way working on cars can? The mechanic industry provides a variety of opportunities for career success. Technology is constantly evolving and changing, opening up new avenues for career choices. A career as a mechanic requires a high level of technical skill and customer service which are the primary ingredients for success. If your biggest motivation is to get down and dirty with your hands while using your mechanical and technical skills, a career as a mechanic may be the perfect fit for you. What you’ll find in this article is a massive amount of information, from choosing a mechanic school to taking that important licensing exam, which will help you in determining whether a career as an auto mechanic is right for you. If you're interested in motorcycle mechanics, check out this career guide. A career as an auto mechanic isn’t for everyone. It takes a certain kind of person, one who likes to work with people as much as they do on those vehicles. Because with every sick vehicle comes an owner who is worried sick about it. If you’re good with this fact and you have the people skills, problem-solving prowess, and the much needed mechanical skills then you probably have what it takes to head to auto mechanic school. To be a great mechanic, you should possess superb communication skills. Because you’ll be working in a customer service-based industry, the better people-person you are, the better chance of repeat customers and referral-based customers you’ll have. If people like you and you’re excellent at what you do, then that’s winning way more than half the battle of the industry. You should also have a solid work-ethic, have above-average problem solving and diagnostic skills, and a superior technical aptitude. If you’re still in high school, take auto repair, electronics, and math to prepare. Go to a trade school or community college and enroll in their mechanics program. Get that diploma or degree to become fully qualified as an auto mechanic. *Potential employers prefer their mechanics to have had a higher level of training from a trade school or community college. Diesel Mechanics work on vehicles powered by diesel fuel such as buses, trucks, and some cars. Aircraft Mechanics repair airplanes, jets, helicopters and any other machine that flies. Motorboat or Marine Mechanics deal with inboard and outboard boat engines. Motorcycle Mechanics spend their time repairing motorcycles, scooters, and mopeds. Farm Equipment Mechanics repair agricultural machinery such as tractors and harvesters. Mobile Heavy Equipment Mechanics are the ones who maintain and repair construction machines such as bulldozers and cranes. There are also areas to specialize in within each niche. Auto mechanics can choose to focus on transmissions, tune ups, front-end, brake, and air-conditioning. The more you specialize and focus on one area of mechanics, the more you can pave the way for yourself. With so many schools offering similar programs, it’s important to be armed with information so you can make the right choice. There are some main elements to look for when choosing a mechanic school. Certified: It is important to attend a school certified by the National Automotive Technicians Education Foundation (NATEF). The NATEF certification proves that the school is exceptionally equipped to prepare their students for all aspects of the mechanic job. Practical Learning: Auto mechanics need hands-on training alongside their coursework. Make sure the school you’re thinking about attending provides both classroom and practical, meaning they teach their students to work on an actual vehicle and its parts. Curriculum: Is the school you’re thinking about staying ahead of the curve? Do they provide their students with bumper-to-bumper instruction? Also, are they up with all the latest technology most automobiles come equipped with and are they able to teach their students how to maintain them? Connections: Is your school well-connected and are they able to offer job placement for their graduate students? What’s their graduation rate and do they have proof their graduates have secured jobs once they went out into the real world? To receive the right kind of training, the kind of stuff that makes you stand out to potential employers, you need to attend an auto mechanic school, whether it’s online, through a certificate program or an associate’s degree program. But, what can you expect from auto mechanic programs? Well, some of that depends on where you go but most programs have the same basic idea of what the curriculum should look like. They should all teach their students about the systems and parts that make up automobiles, how to maintain them and how to fix them. Also, the students will learn what the tools of the trade are and how to use them in their daily job life. Certificate programs will focus on career-specific courses and will not include any general education classes. The benefit of a certificate program is that it is a shorter program than the associate’s degree which allows the student to get out into the workforce quicker. However, the program isn’t as well-rounded, but to many, that isn’t an important aspect. In a certificate program, the student will learn how to take care of vehicles, everything from routine diagnosis and maintenance to large-scale repairs. There are some specialized areas a student can focus on like certain types of engines and specific types of vehicles and their parts. The student may also choose to focus on diesel mechanics and only work with diesel parts. Check with your program to see what specialties they offer if you’re interested in that. Examples of common courses found in certificate programs are an intro to auto technology, diesel service techniques, auto electrical, fuel and emissions systems. Associate’s Degree Programs are considered to be well-rounded and will prepare students if they decide to do so, continue on for a bachelor’s degree. However, receiving an associate’s degree prepares the student to join the workforce, similar to the certificate program immediately. It does take a bit longer to complete at two years if you are a full-time student. This may make it harder for some students to work while getting their degree because of the intensity of the coursework. An associate’s degree in automotive service technology will not only include career-specific courses, but it will also have general education requirements. The student will also take business management classes which are important, particularly to those who want to work on their own once they graduate. Some common courses you can expect in the associate’s degree program are advanced transmission diagnostics, auto mechanics technology, service management, and alternatively fueled and hybrid vehicles. 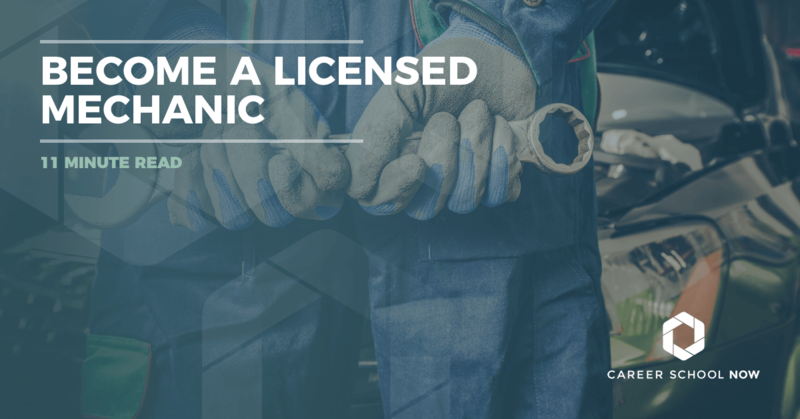 The licensing for auto mechanics varies by state. Texas, New Jersey, and Florida are the exceptions and do not require their auto mechanics to be licensed. The benefit of getting licensed it that it reinforces the fact that you’re highly qualified and not only deserve the job you’re applying for but that the shop is lucky to have you. It also gives peace of mind to vehicle owners knowing that are in capable hands. The first license an auto mechanic needs is either their diploma or degree which proves they received their education from a school. After that, there are quite a few licensing options to choose from. The ASE or Automotive Service Excellence exam is the industry standard which determines the skill of the auto mechanic. The exam is computer-based and monitored, and it is given at specified locations which vary by state. Within the ASE, it is divided into vehicle types and their systems. Within each section: buses, cars, and trucks, these are further divided into eight core certifications per vehicle type. The certifications cover engine repair, automatic transmission and axle, manual drive train and axles, suspension and steering, brakes, electrical and electronic systems, heating and air, and engine performance. Try our ASE mechanic practice tests. ASE Master Certification: One all the sections of the ASE are passed, you will then have the opportunity to take the Master Certification exam. This exam is divided into series which include cars, medium to large trucks, and transit buses. Once all the series are passed, Master Mechanic status is achieved. However, this is not a life-time certification and must retake every five years, or you’ll lose your master standing. Manufacturer Certification: If you wish to be the cream of the crop, then it’s a good idea to consider improving your technical skills. This can be done through the certifications many manufacturers offer. There may be extra required courses and hands-on learning, but this varies by manufacturer. Ford FACT: The Ford Accelerated Credential Training program provides mechanics with Ford-specific training, making them an asset to dealerships. It is a one-year program with a 15-week capstone course in Service Technician Specialty Training (STST) Ford curriculum. Students are trained at a Ford sponsored facility by certified instructors. Volvo SAFE: This 14-week course offers 12 Volvo specific factory credentials which put the student on a fast-track toward master mechanic status. It is an exclusive training program. Therefore there are strict qualifications the must be met before a student is accepted. International Trucks ITEP: This is an invitation only, manufacturer paid program that lasts 15 weeks. The graduate can earn up to 89 factory credentials in 14 categories. To be qualified, you must have a high GPA, perfect attendance, and a squeaky clean drivers record. There’s an entrance exam, a drug test, and an in-person interview that must also be passed. Toyota TPAT: Earn nine Toyota and five Lexus University of Toyota course credits through this program. Become a Toyota Technician Expert upon completion of all the credits, and be Toyota Maintenance Certified. Certifications need to be renewed every five years, it’s the industry standard. By doing this, it enables auto mechanics to stay up-to-date on the constantly evolving technology of vehicles. There are a few different options for becoming a certified auto mechanic. They are either online, from a certificate program, or an associate’s degree program. After a certificate or diploma is received, there is the option to take the certification exam through the National Institute for Auto Service Excellence (NIASE). Online: tools and study guides to be used at the location of where the student is studying. There should also be a balance of in-person instruction, particularly for the hands-on work. Certificate Programs: These should include all the materials for the hands-on study portion including engines, transmission systems, and auto diagnosis, repair and maintenance courses. Expect additional fees for books, tools, lab fees and other miscellaneous items which can add between $1,000-$3,000 to the total. Degree Programs: The major bulk of the cost should include all coursework, including the required general education courses along with the auto mechanics classes. If the degree program is at a university, expect an additional cost of $5,000-10,000 for room and board, plus similar fees as the certificate programs. There is always financial assistance and scholarships to look at to help alleviate the cost of school. Find out more information on financial aid here. And, always speak with a school admissions personnel to find out what the options are, as well. Auto mechanic and small engine mechanic careers are looking at an employment growth of six percent through 2026. This is about average when you compare it with all other occupations. There are more car owners than ever before which will create job openings for entry-level mechanics to do the basic repairs on these vehicles. However, with the self-driving cars looming in the not-so-distant future, along with electric cars gaining popularity, mechanics will need to keep up with the rapidly growing technology to stay relevant. Diesel service technicians, however, will see a larger employment growth rate of 10 percent through 2026. Diesel powered vehicles tasked with carrying freight across the country, as well as the ever-growing popularity of diesel-fueled cars, will help drive the employment growth of automotive mechanics qualified to work on diesel-powered engines.